Multiphysics problems are encountered when the response of a system is affected by the interaction between several distinct physical fields (e.g., structural deformation, fluid flow, electric field, temperature, pore-pressure,etc.). Many problems in engineering and science involve some level of coupling between different physical fields. In the past, due to the lack of computational capabilities, these coupling effects were either ignored or taken into account very approximately. However, with the current analysis capabilities available in ADINA, many important multiphysics coupling effects can now be included accurately. By including these coupling effects, the analyses provide deeper insight into the performance of designs, leading to more economical and safer products, and also to a better understanding of the causes and consequences of natural phenomena . Mathematically, multiphysics problems are described by a set of coupled partial differential equations (PDEs). The solution of these equations poses a challenge regarding the robustness of the algorithms to handle such interactions in a general and efficient manner. 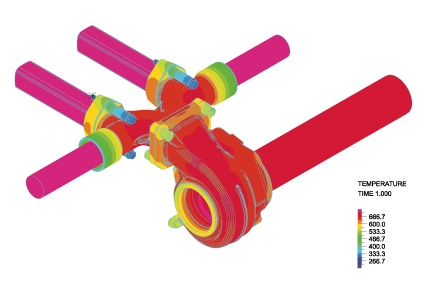 The multiphysics capabilities of ADINA are unique both in their breadth and depth. Using these capabilities, not only a wide range of interactions between different physical fields can be considered, but each of these fields is treated in a general form without compromise on accuracy. ADINA FSI offers comprehensive capabilities for solving problems involving the interaction between general nonlinear structures and general Navier-Stokes or Reynolds fluid flow all tightly integrated in a single program. For detailed information on ADINA FSI, refer to our page on fluid-structure interaction capabilities of ADINA. The solution of fully coupled thermo-mechanical problems can be performed with ADINA TMC. In this class of problems, the temperature distribution affects the structural deformation and the structural deformation may affect the temperature distribution. For detailed information on ADINA TMC, refer to our page on thermal-mechanical coupling capabilities of ADINA. This multiphysics problem is characterized by the coupling between the pore pressure and the deformation of a porous material (e.g., soil, biological tissues…) consisting of a solid skeleton and pore fluid. Mechanical deformation changes the pore pressure and change in the pore pressure causes mechanical deformation. A variety of constitutive models can be used for the skeleton, such as: elastic isotropic, orthotropic, thermo-isotropic, thermo-orthotropic, thermo-plastic, Drucker-Prager, Mohr-Coulomb, Cam-clay, creep, plastic-creep, etc. 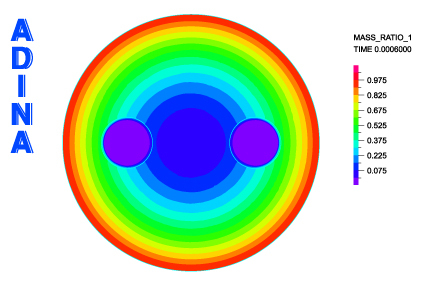 In this class of multiphysics problems, heat transfer, fluid flow and the mechanical deformation are all coupled. As an example, the fluid flow changes the temperature in the system and this change of temperature causes mechanical deformation changing the boundary conditions for the flow, thus affecting the flow. For detailed information, refer to our page on thermal-fluid-structure interaction capabilities of ADINA. Piezoelectric problems are characterized by the coupling of the electric field and mechanical deformation. Applying an electric field to a piezoelectric material causes mechanical deformation and the mechanical deformation causes an electric field. This phenomenon is the basis for the design of many sensors and actuators. 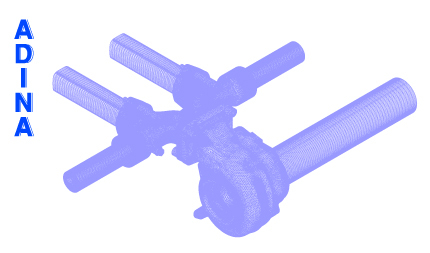 An iterative solution of the electric field and structural deformation is implemented in ADINA TMC. Users can also implement nonlinear constitutive relations between the electric displacement (electric flux) and the strain tensor (piezoelectric matrix). Joule heating is characterized by heat being generated by an electric current. The heat affects the surrounding media. In some practical applications, the fluid can be assumed to be inviscid. This assumption significantly reduces the computational effort required for calculation of the fluid response and also in the fluid-structure interaction problems. This multiphysics capability is particularly useful when the frequency response of coupled fluid-structure systems is of interest. This class of multiphysics problems is characterized by the coupling between the momentum, continuity and energy equations governing the flow of a mixture of a fluid and other species (solute). The coupling is due to the dependence of the mixture’s density and viscosity on the solute concentration. Transfer of the solute due to the flow changes the spatial distribution of the mixture density and also its viscosity, consequently affecting the flow pattern, which in turn affects the movement of the solute. In this class of multiphysics problems, the fluid flow is driven by the Lorentz forces caused by the electromagnetic field. K. J. Bathe, The Finite Element Method, in Encyclopedia of Computer Science and Engineering, B. Wah (ed. ), J. Wiley and Sons, 1253-1264, 2009. For many examples of applications of ADINA in multiphysics problems, see our Publications page.